The city is a super clean, efficient and safe place. Safe does not mean that there are no risks or crimes, just that is is safer than Adelaide. They have a lot of security, many cameras in public places like shops and train stations (MRT). The trains are super efficient, they run every five minutes from about 5:30 to midnight. Sometimes it might be 8 minutes but 5 is normal and 2 minutes during peak hours. The trains are fully automatic, that means no drivers, conductors etc. The future has arrived. Security is somewhat over done, they even want an ID to buy tickets for such things as the Singapore Air Show. You enter using a social pass, which means just as a tourist with a stamp and approval for a 90 day stay. Then on the day you do your final uni enrolment procedure there will be some people from the ICA (Immigration Control Authority). They then organise to issue a Student Pass that allows you to stay for the duration of your study. 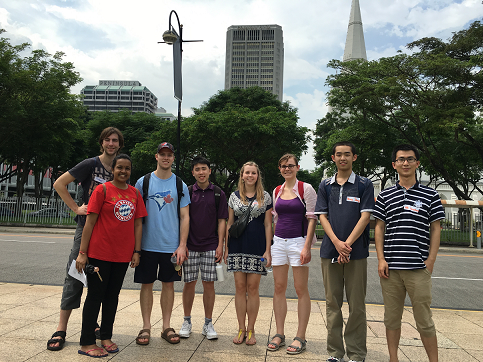 At the end of the study you then apply for a social visit if you want to do some sight seeing. The Student Pass must then be used for entry and exits along with your passbook. The Student pass also gives easy access to Malaysia, on presentation of Passport and Student Pass they just stamp your passport, not take fingerprints which the Malaysians normally do, and in you go. The Singaporeans have already taken your thumb prints before issuing the Student Pass. See what I mean by security. However, because of those thumbprints, you can use the entry/exit system for Singaporean Passports at the airport and thus go through faster. The cost of living it about the same, the food is mostly Asian of all varieties which means lots of rice and not as much meat as you might be used to. Western food is available, but costs more that the local food if you want Aussie sized meat portions. McDonalds, KFC, Pizza Hutt and Starbucks etc. are here, though not as common as in Australia. They have many coffee outlets, but they are not as good as back home. Being so close to SE Asia it pays to travel as much as you can, the air fares are lower and shorter. You can get to Indonesia or Malaysia or Thailand for a weekend with no problems (except the perennial one of can you afford it.). between lectures to get to the next lecture. Tutes are also two hours but done once a fortnight instead of once a week. They use a combination of CA (Continuous Assessment); assignments, tests, tute attendance etc and a final exam. The work load is about the same as Adelaide, perhaps with more reading and a lower standard of difficulty. The city is one degree north of the Equator, (and 104 degrees east). It is hot. The humidity is the thing. Be prepared to sweat a lot if you have no air-con as was the case for my student accommodation. Most buildings are air conditioned. Some times the air-con is on too strong and you will need to bring a jumper for some of the buildings. The rain is tropical, that is warm and regular in the wet season. However, Singapore is too close to the equator to get tropical storms. Singaporeans are polite and helpful. English is the official language, however, the older people do not speak English or only poorly, there are many migrant workers whose English is poor and many Singaporeans have a strong Chinese accent. But these are only minor problems you can get along well with just English. All classes are conducted in English. 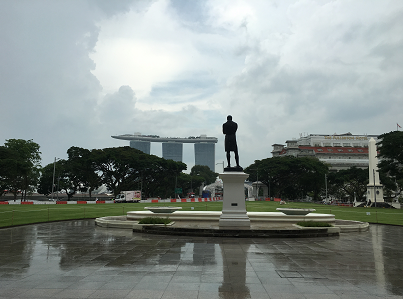 Singapore is an Asian country and culture with strong Western influences and a fully developed economy. I think the developed economy makes it look more Western than it really is. There is very little poverty, full employment, an efficient administration and a free market that allows business lots of opportunity to trade. The place was founded as a trading city, it has no minerals, no hinterland, no agriculture to speak of and an insufficient home market. Singapore was treated brutally by the Japanese in WWII, after the British failed to protect the city. With independence (that was actually thrust onto them by Malaysia) they have decided that “no one owns Singapore a living” and work hard to maintain their viability. It is an economic success, an Asian Tiger. Speaking of tigers, there used to be tigers here and occasionally Chinese workers were killed by tigers in the past. The tigers are now only in the zoo. Singapore, or Singapura in the ancient Sanskrit, means lion city. The name comes from a miss identification of a tiger as a lion back in the early days, but the name stuck. 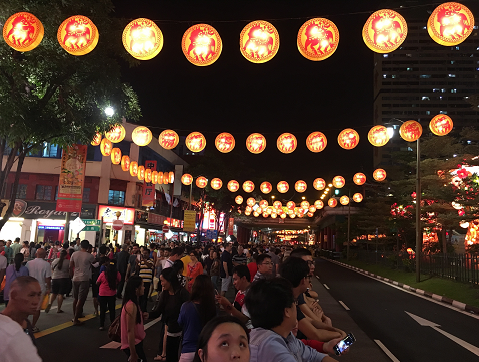 This entry was posted in Exchange, Faculty of Arts, Singapore, Student Blogs and tagged academics, Asian Tiger, culture, Faculty of Arts, ICA, lion city, National University of Singapore, NUS, Singapore, social pass, teaching style. Bookmark the permalink.